A selection of mics, including the DPA d:facto™ Vocal Microphone, are helping the band achieve audio consistency in numerous different venues. Earlier this month indie rock luminaries Bombay Bicycle Club became the very last band to play London's legendary Earl's Court venue, which is soon to be demolished. The band took to the stage as part of an epic world tour, which not only highlighted the success of their So Long, See You Tomorrow album but also allowed them to use DPA microphones extensively on the road for the first time. And if delivering the last ever gig at Earl's Court wasn't enough, Bombay Bicycle Club also happily accepted a special guest when Pink Floyd's Dave Gilmour joined them on stage. Gilmour first played steel lap guitar on the band's song Rinse Me Down, before giving an emotional rendition of Wish you Were Here, backed by Bombay Bicycle Club. As with all of the performances that night – and during the entire tour – DPA microphones were on hand to ensure exception audio quality. Tour Manager Steven Down has been working with the band for five years. He says: "Jon Burton, the previous FoH engineer, brought the DPA d:facto™ Vocal Microphone to our attention while he was reviewing equipment for one of the pro audio magazines. Jack Steadman (lead vocals) gave it a go during the warm up tour we did at the start of this campaign and he was very impressed with the clarity compared to the dynamic mics we had been using previously. Shortly afterwards we obtained a capsule to use on our Sennhesier wireless system for Liz Lawrence who does a lot of backing vocals in the show. More recently we have started using d:dicate™ 2011C Twin Diaphragm Cardioid units on the kick and snare and some d:vote™ 4099 Instrument Microphones on the toms with great results." Downs adds that the Bombay Bicycle Club show moves from songs with loud distorted guitars and heavy drums to quiet and intimate piano and vocal solos. "I think the dynamic range and the frequency response of the d:facto really allows Jack to perform with confidence in all situations," he says. Steadman himself is certainly a fan of the d:facto Vocal Microphone. "The wonderfully clear, bright sound of the mic means I don’t have to mess around endlessly with EQ to get the results I want," he says. Also happily not messing around with EQ too much is Simon Lutkin, freelance sound engineer and production manager who first took over monitors for the band during their Different Kind Of Fix tour in 2012. "We have drums, bass, guitars, keys, percussion, backing vocals and a brass section onstage during the show — it can get pretty busy!” he says of the current set-up. “Currently the show is around 40 channels but both Tom Wiggans (FoH) and myself try to keep the channel count down as much as we can. A lot of the shows we do are festivals and rolling in with too much can be a problem for broadcast and patch." Everyone has in-ear mics, but Lutkin also uses wedges on the downstage edge and side-fills to add feeling. Add to that up to nine people at any one time and the stage can get pretty full. "With that many on stage, any help I can get through technology is great,” Lutkin says. “I use scenes for each song to make small changes automatically through the show so I can keep my eye on the band. 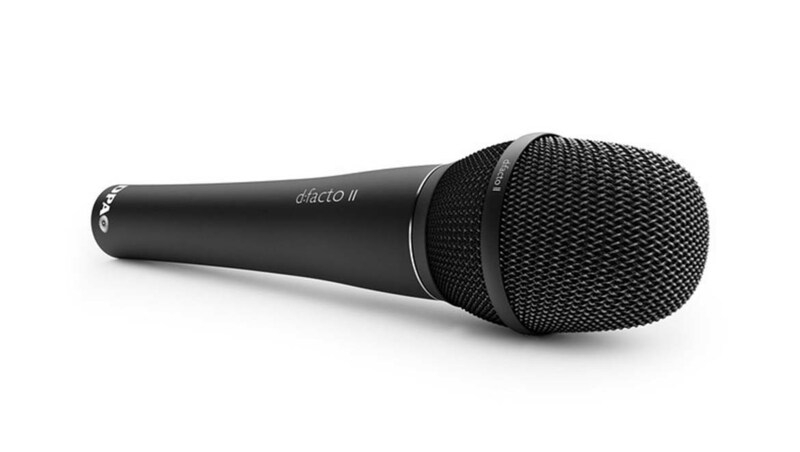 The d:facto Vocal Microphone really helps control the ambience for the main singers. Compared to other mics, as well as having a pretty tight pickup pattern, the overall tone of the spill is much nicer to listen to. In a live scenario you are always up against bleed from other sources, but with this set of mics the spill is much more pleasant sounding and therefore can be a help rather than a hindrance." All of the band's DPA mics were supplied by the company's UK distributor Sound Network. Alongside the d:facto, the tour configuration sees Lutkin use d:dicate™ 2011C mics on both kick and snare because they are small enough to be deployed exactly where he wants them and light enough to stay in place without putting any pressure on the stand or clamp. d:vote™ 4099 Instrument Microphones are also in use for rack, floor, crash, ride and the brass section. To maintain consistency the group carries all the mics and IEMs with them internationally, simply hiring in consoles locally (a DiGico SD7 for FoH and Midas Pro2c for monitors), thus ensuring that the signal path from source to output is the same each day.